My Beatport DJ chart January 2018 is available! Tic Tac Trance #121 Replay available! Happy New Year! I hope you all had a good start into the new year and that most of your goals will be accomplished! 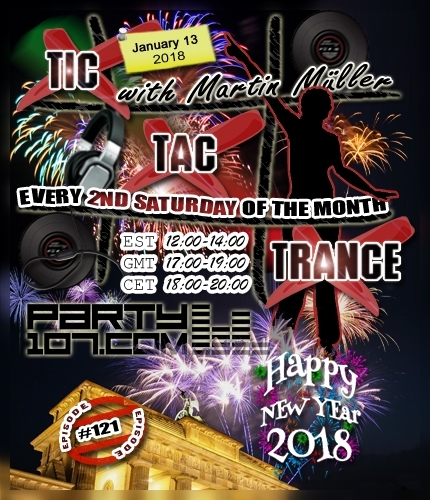 Episode #121 of Tic Tac Trance will be broadcasted on January 13 2018 on Party107.com. This time I’ve prepared an uplifting & psychedelic 2 hours underground trance mix which features tunes of labels like Flashover, Subculture, Iboga, FSOE, Spin Twist and many many more! Make sure to tune in! I wish you all a Happy New Year 2018! Please enjoy this little slow tempo (128-132BPM) one hour mix!